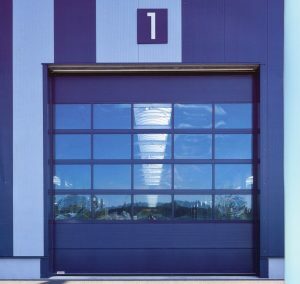 Sectional door steel - commercial and industrial This door is designed to suit most commercial and industrial applications and widely used on carpark entries, commercial and industrial vehicular doorways, workshops, loading docks and essential services depot. 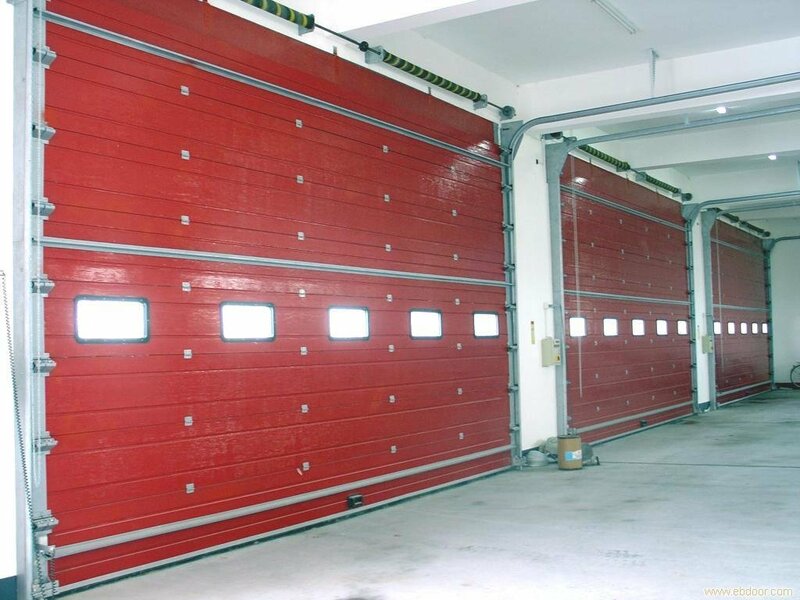 The steel door sections shall be 600mm high and manufactured from two 300mm high by 40mm deep roll formed, ribbed faced, double interlocking door panels. The panels shall be .6mm thick galvanised or colourbond steel, stitch riveted to form an interlocking integral strengthening strut to the full width of the door section. End and intermediate stiles shall be riveted to the door sections and manufactured from 1.6mm galvanised steel channel to provide rigidity and strengthening to the whole door construction to provide secure fixing of hinges and roller hinge brackets. Where doors exceed 5000mm in width, double end stiles shall be fitted. Bracing shall be incorporated where deemed in design and shall be fitted to the back of each door section and manufactured from galvanised "C" section, fixed to the end and intermediate stiles using a galvanised steel angle. Weather seal is an extruded PV.C. section and shall be fixed to the bottom of the door section. Insulated doors (see optional extras). Standard design is recommended up to 5,000mm high by 6,000mm wide and insulated to 4,500mm high by 5,500mm wide. Should openings exceed these sizes, the manufacturer should be contacted. 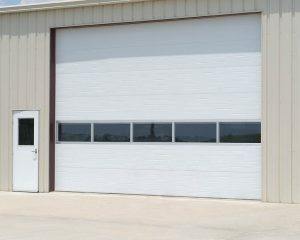 The doors are normally operated by hand by one person quickly and easily. Doors over 4000mm high shall be fitted with a quick action chain drive and still providing ease of operation (optional extra for doors below 4 metres in height). The door sections are available in galvanised or standard colourbond finish. Fully glazed, aluminium window sections and inserted viewing panels (see optional extras overseas). May be fitted(275mm high by 700mm wide) or (150mm high by 600mm wide) in single or multiple rows. All doors can be electrically motorised or remote controlled (refer to installation detail sheet). Can be fitted to the external door jambs and head. With 40mm semi-rigid compressed fibreglass. Are a special design (consult the manufacturer). Can be provided by (hooded) louvers or perforated with 9mm diameter holes. 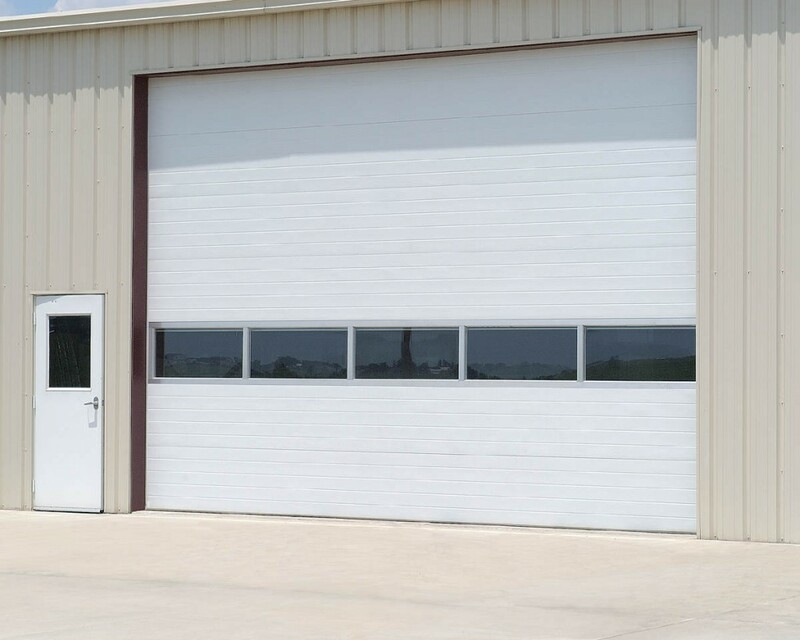 The sectional overhead steel panelled door will be as manufactured by 3rd Generation Doors. The door sections will be constructed from two 300mm high by 40mm deep roll formed, ribbed faced, double interlocking door panels. The panels will be .6mm thick galvanised or colourbond steel (as specified) stitch riveted together to form an integral strut to the full width of the door and fitted with bracing as required. The door will be supplied with all necessary hardware, spring counter balancing mechanism and tracking (standard headroom, low headroom, high lift or vertical lift as specified) and installed to the manufacturers recommendations. For further information (Tracking etc.) see installation detail sheet. Hardware: Brackets and hinges will be manufactured from heavy gauge galvanised steel having a minimum thickness of 1.6mm to a maximum of 4mm. Where doors exceed 5000mm in width, will be fitted with double hinge wheel brackets and long stem shaft wheels. Top wheel brackets will be adjustable to suit the radius track. Bottom bracket will be fitted with fixture pin to match the wire cable. Hinged wheel brackets will be stepped in height to provide an inclined angle to give a wedge type closing. Steel centre hinges will be fitted to steel doors. Aluminium centre hinges will be fitted to all aluminium framed doors. Manufactured from extruded aluminium having a thickness of 4mm and fitted with a 6mm diameter pin. Wheels will be a steel ball bearing complete with a ten 6mm diameter balls hardened and steel shaft of 11mm diameter. Tracks will be manufactured from 2mm thick galvanised steel "C" channel 26mm wide by 52mm deep. 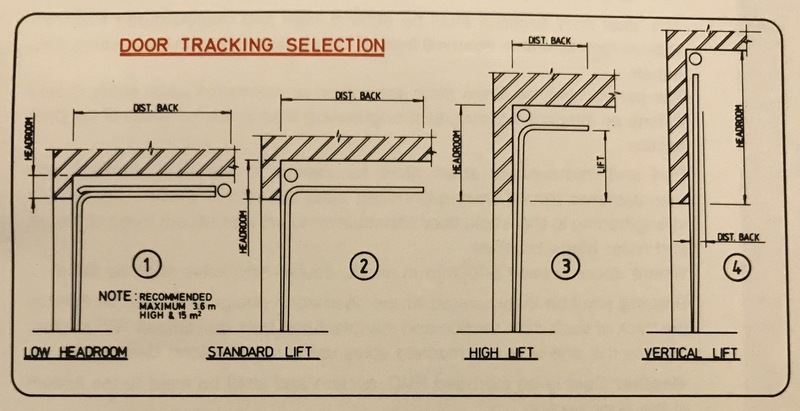 Vertical tracks will be fitted on an inclined angle to provide a wedge type closing action and fitted with brackets for fixing to brick, steel or as required. Horizontal tracks will be reinforced with steel angle 40mm x 3mm thick. The tracks will be supported at the ends and where tracks exceed 3000mm a centre support will be provided. Torsion Bar will be designed to match the door weight, and manufactured using 25mm diameter tube and or solid steel bar. The shaft will be supported at either end and the centre, with end plates and centre anchor plate fitted with bearings. Chain Hoisting will be fitted where doors exceed 4000mm in height or when specified. Counter Balance Springs will be helical wound torsion springs. The assembly will consist of the springs fitted to aluminium alloy spring winding cones, bolted to the spring anchor bracket mounted on the wall. The other end of the spring cone will be locked to the steel shaft. Cable Drums will be manufactured from aluminium alloy and designed to match door weight and securely fixed to the torsion shaft. Lifting Wire Cables will be manufactured from galvanised, aircraft quality wire cable and have a safety factor of 6:1.